Improve design phase efficiency with hassle-free access to model health and quality analytics. 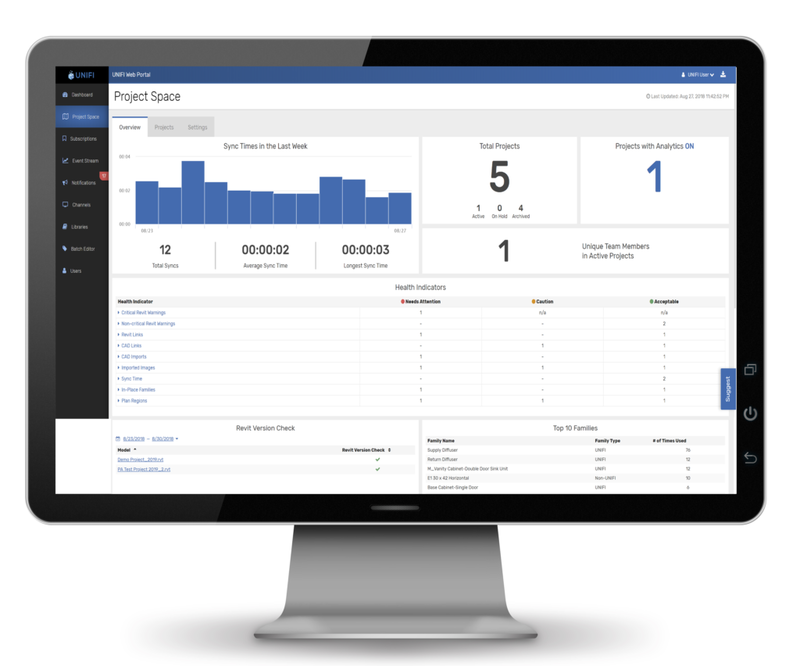 Project Analytics is our latest feature addition to UNIFI CORE, our premium BIM Library Content Management Software. Model health and quality monitoring with diagnostics. Helps you identify issues before they become serious problems. Health indicators with customizable alerts. Manage Revit warnings and categories by urgency. Drill down into the specific issues and related users for swift corrective action. Real-time data that updates with every sync to central. Set-up in minutes with 3 simple steps. No coding, no integrations, no extensive training. Start tracking 20 projects for FREE when you sign up for our premium content management software UNIFI CORE*. *minimum purchase of 30 Active or 10 Open Licenses. Offer available throughout 2018 only. Q -What is project analytics? A – Project analytics is a new feature for UNIFI CORE, our premium library and BIM content management software. Project analytics gives UNIFI CORE users hassle-free access to model health and quality analytics in minutes. It operates as a 2-in-1 data extraction and data visualization tool that dramatically reduces the hassle of setting up analytics. Q – How does Project Analytics work? A – Project analytics pulls an incredible amount of model (.rvt) data from Revit and displays that information through pre-designed dashboards with customizable alerts. If your project has multiple models, you can group unlimited models under 1 custom project created within Project Analytics to see combined model analytics. Q – Who is Project Analytics for? A – Project Analytics can help anyone responsible for supporting or managing the efficient production of healthy and high quality Revit models. These role are usually limited to BIM Managers, Design Technologists, BIM Leads and Project Managers. Q – How does Project Analytics make the design phase more efficient. A – Poor model health and quality can lead to a number of issues that waste time and money. Project Analytics gives you the ability to monitor your models for common issues and anomalies. You can also drill down into the specific issue within your Project Analytics dashboard to identify the specific cause for swift corrective action. Project Analytics is also incredibly easy to use, if you are using UNIFI CORE you can be up and tracking in minutes. No more time wasted on complicated solutions that require coding and multiple software integrations. Q – What work-sharing or collaboration environments does Project Analytics work with? A – Project Analytics works with BIM 360, Revit Cloud Worksharing, C4R, Revit server, and of course your local server. Q – Is there an API? A – Our API solution will be available later in the year. If you are interested in an API solution only please contact us and note your interest. We will reach out to better understand your data needs and support you accordingly. "Our models not only fit the customer’s needs, they help us to create long lasting relationships across our diverse brands." © 2018 UNIFI Labs, Inc.
UNIFI Project Analytics is brought to you by UNIFI Labs. Pricing was not known at press time.